We are a small producer of crafted local spirits, rebuilding a brand that was well known on the coastline of northern Germany for more than 100 years but disappeared in the late 90s. We attach a bottle shot. Screw cap can be in silver, gold, white, black or copper). The bottle is totally covered in blue. The product inside is a "Kümmel" (meaning cummin) and is comparable to a nordic aquavit. The product has a clear color, 40% alcohol and is served in frozen glasses but at roomtemperature as a digestif. The full brand name (to appear on the bottle) is "Krahnstöver Kümmel". Krahnstöver is the name of the founding family from 1803. The old factory in the city of Rostock is still there, although it has been converted to appartments, offices and a café. 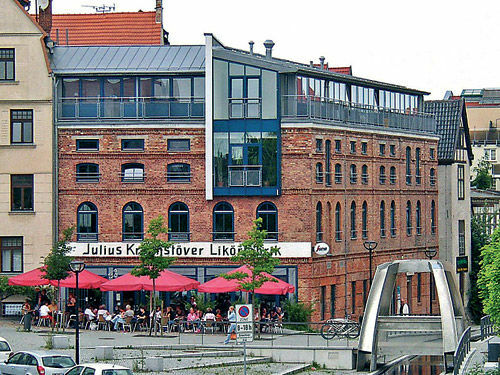 The old brick building is one of the most visited buildings of the city of Rostock and present in every city guide. We would like you to create a printed label (it will not be paper label but printed directly on the bottle and its blue color) that is modern but plays with the rich history of the building/the old factory/the old company. It should have a reminiscence to the past but be modern enough for today´s consumers. Therefore, fonts can be modern. Since the spirit is local, a link to it´s roots in Rostock should be easy to spot for both locals and tourists looking for a gift. Just to round it up: We produce two other products, one in a red bottle and one in a white bottle. The colors red, blue and white are the city´s colors. The design on all the three bottles will be the same, so it´s obvious that they belong together. Just the product names will of course differ: "Krahnstöver Korn" (made from wheat and stored in oak barrels) and "Krahnstöver Kräuter" (resembling type of Jägermeister with lots of botanicals).